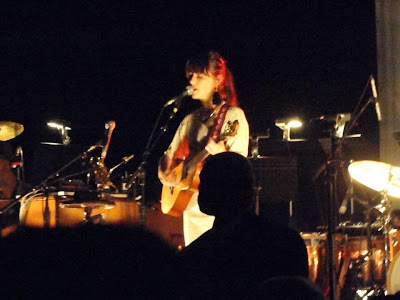 Under the warm smoldering embers of orange light of Radio City Music Hall, with the soft tactile feel of its red velvet chairs beneath my strumming fingers, I rocked slowly back and forth to the the lullaby hymns of Feist. My belly was warm and full with wine, food, and laughter shared with my oldest friend. We were 5 rows away from the stage- the figures of the small army of Feist's orchestra were close to life size, a welcome change from the birds eye view of ant sized musicians I am normally granted at Radio City. The good feelings were vibrating throughout the cavernous hall, a few hundred of Feist's army of fans before me, while behind me miles of avid fans all danced and smiled along. The relaxed amusement and ease of the audience was contagious and welcome. I basked in the comforting warmth of the hall and its habitants, like it was a cave filled with the light of a summer day. The sounds of violins, singers, numerous drums, and acoustic guitar all layered into a harmonious string of thread. This aural string of thread was then woven into a fabric, a beautiful tapestry of sound which undulated in the melodic breeze of Feist's feathery voice. I found myself swaying side to side like an underwater plant to the beat of the music. It was a lullaby dance that kept me centered and comfortable, a feeling that is hard to give up when you manage to find it in New York City. Luckily, no one seemed to want to let that feeling go, not even Feist. There was even a passing moment where she pleasantly whispered into the mic that as the show came to a close, she'd turn into an arc of light above the music hall and shine for all of New York to see in the pale of the moon. We all decided to join her as the set finally reached its closing tune. We all became rays, rays of feisty sunshine with wide moonbeam grins.